People mistakenly think that this movie is some kind of holiday feel good trifle, but I’m here to tell you that if that’s all you think about this movie, then you’re missing out. Seriously. Sure, it’s got sweetness, warmth and sentiment, but it’s also got depth and sincerity and disappointment, resentment, anger, bleakness, depression, and evil. It’s also got a significant message about fairness, doing the right thing, and economic equitability that is as resonant now in our time of corporate takeover and the Occupy Wall Street’s push back against the banks and other corrupt financial institution in our country as it was at the end of the Great Depression when it was made. Few mainstream movies better capture issues of class warfare in human terms than this one. It also demonstrates the importance of community and people working together for the common good. 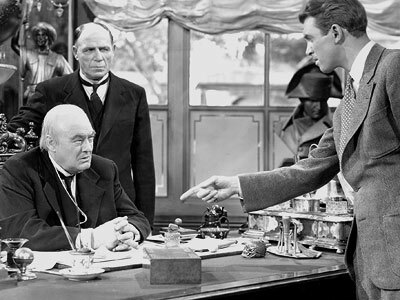 George Bailey and his father are champions of the common man (dare I say the Proletariat) against the fat cats and politicians and bankers. The disdain that director Capra has for these folks is all rolled up and amplified in the truly evil presence of Mr. Potter. POTTER: Have you put any real pressure on those people of yours to pay those mortgages? BAILEY: Times are bad, Mr. Potter. A lot of these people are out of work. BAILEY: But they’re somebody’s children. BAILEY: Well, all right . . .
POTTER (interrupting): Not with my money! BAILEY: Mr. Potter, what makes you such a hard-skulled character? You have no family –– no children. You can’t begin to spend all the money you’ve got. POTTER: So I suppose I should give it to miserable failures like you and that idiot brother of yours to spend for me. Later in the movie he goes further with his vitriol for the working man trying to get a piece of the American Dream and those who want to assist in that dream. Potter: [referring to the fact that the building and loan gave a mortgage to a cabdriver that Potter’s bank turned down… [What does that get us?] A discontented, lazy rabble instead of a thrifty working class. And all because a few starry-eyed dreamers like Peter Bailey stir them up and fill their heads with a lot of impossible ideas. “This rabble you speak of Mr. Potter do most of the working and paying and living and dying in this town well is it too much to have them work and pay and live and die in a couple of decent rooms and a bath? Anyway, my father didn’t think so. People were human beings to him, but to you, a warped, frustrated old man, they’re cattle. Well, in my book he died a much richer man than you’ll ever be! This town needs this measly one-horse institution if only to have someplace where people can come without crawling to potter. Oh, I’m sorry, Pop, I didn’t mean it that way, but this business of nickels and dimes and spending all your life trying to figure out how to save three cents on a length of pipe…I’d go crazy. I…I wanna do something big and something important. Peter Bailey: You know, George, I feel that in a small way we are doing something important. Satisfying a fundamental urge. It’s deep in the race for a man to want his own roof and walls and fireplace. And we’re helping him get those things in our shabby little office. SCHULTZ: Martini, you rented a new house? MARTINI: I own the house. Me, Giuseppe Martini. I own my own house. No more we live like pigs in this a Potter’s Field. REINEMAN: Look, Mr. Potter, it’s no skin off my nose. I’m just your little rent collector. But you can’t laugh off this Bailey Park any more. Look at it. A buzzer is heard, and Potter snaps on the Dictaphone on his desk. SECRETARY’S VOICE: Congressman Blatz is here to see you. POTTER (to Dictaphone): Oh, tell the congressman to wait. REINEMAN: Fifteen years ago, a half-dozen houses stuck here and there. There’s the old cemetery, squirrels, buttercups, daisies. Used to hunt rabbits there myself. Look at it today. Dozens of the prettiest little homes you ever saw. Ninety per cent owned by suckers who used to pay rent to you. Your Potter’s Field, my dear Mr. Employer, is becoming just that. And are the local yokels making with those David and Goliath wisecracks! POTTER: Oh, they are, are they? Even though they know the Baileys haven’t made a dime out of it. REINEMAN: You know very well why. The Baileys were all chumps. Every one of these homes is worth twice what it cost the Building and Loan to build. If I were you, Mr. Potter. . .
POTTER (interrupting): Well, you are not me. REINEMAN (as he leaves): As I say, it’s no skin off my nose. 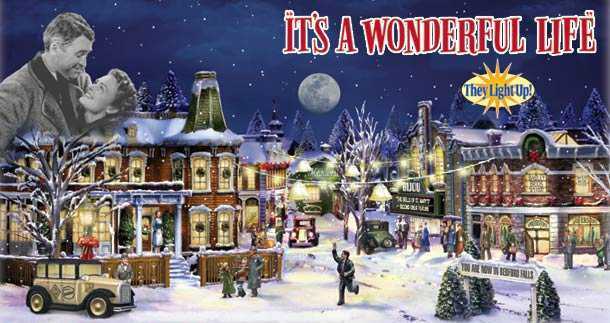 But one of these days this bright young man is going to be asking George Bailey for a job. A couple important pieces in this section. Mr. Potter gets a visit from a Senator and because he is such a powerful figure with political ties simply tells his secretary nonchalantly to have the Senator wait. The Senator is treated as if he’s simply another of Potter’s henchmen. Also in that scene, Potter’s obsession with maximizing profit is shown. He can’t comprehend that the good the Baileys have done matters AT ALL because they do not personally gain from it. In a way, this single line sums up Mr. Potters world view and is at the heart of much of what all the anger toward banks and corporations with Occupy Wall Street is about, too. Community good isn’t part of the equation for today’s corporations. Maximizing profit is the ONLY driver, just like with Mr. Potter. This kind of approach to running the world is shown to be the horror that it is in Pottersville after George is granted his wish to never have been born. Instead of Bailey Park with its affordable housing, we get the slums and ramshackle hovels that Mr. Potter rents out. People in this version of the world barely scrape by in a subsistence manner and never have access to their own homes or a piece of the dream. It is in fact just a nightmare where Mr. Potter gets richer and everyone else suffers. GEORGE: No, but you . . . you . . . you’re thinking of this place all wrong. As if I had the money back in a safe. The money’s not here. Your money’s in Joe’s house . . . (to one of the men) . . . right next to yours. And in the Kennedy house, and Mrs. Macklin’s house, and a hundred others. Why, you’re lending them the money to build, and then, they’re going to pay it back to you as best they can. Now what are you going to do? Foreclose on them? In a way, George is also being prophetic about the credit crisis we’ve seen in the past few years as the largest corporate banks sit on cash like hoarders while small businesses suffer and people lose their houses. The Bailey Building and Loan, like Credit Unions use our investments to help others in our community buy their home or improve their home or send their kids to college. 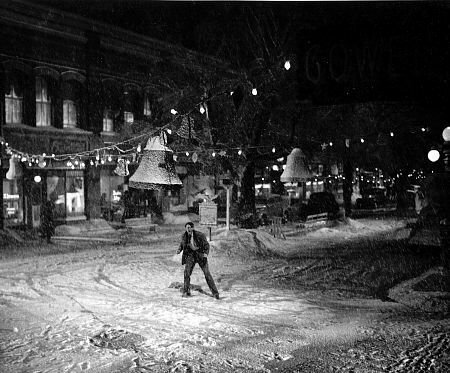 Ultimately, It’s a Wonderful Life has a hopeful message about brotherhood and community, but in a way, it’s the dark parts that teach us the most about the kind of world we want. 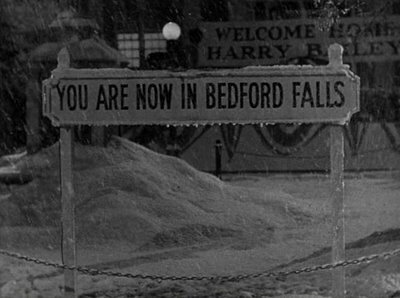 The 99% and the Occupy Wall Street folks and I want a world like Bedford Falls NOT Pottersville.